Everyone is welcome to join us for this short communion service including a pause for thought, familiar words and hymns and an opportunity to join in with conversation over refreshments. For more information, please contact Louise Franklin or the church office. 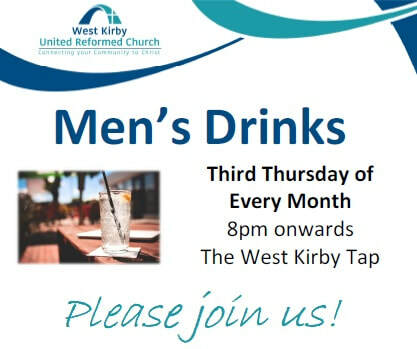 Men are all very welcome to join us for Third Thursday drinks and chat, just come along to The West Kirby Tap on Grange Road. Members of our Toddlers for Dads team regularly attend, so we hope there will be some familiar faces that dads and grandads coming along for the first time will recognise. For more information, please contact Simon Lakin or the church office.